Togl Enhanced Togl widget, a Tk widget for displaying OpenGL content. OpenGL Wrapper for core OpenGL functionality and OpenGL extensions. Util Tcl3D utility library: Math functions, standard shapes, stop watch, demo support. The SWIG wrapper files as well as the C and Tcl utility files of all modules are copyrighted by Paul Obermeier and distributed under the BSD license. See below for exceptions regarding single files and the external libraries. This module is an enhanced version of the Togl widget, a Tk canvas for displaying OpenGL graphics. OpenGL Core and Compatibility profile support. Requirements for this module: None, all files are contained in the Tcl3D distribution. The original Togl widget is copyrighted by Brian Paul and Benjamin Bederson and distributed under the BSD license. See the Togl homepage for detailled license information. The modified Tcl3D version of Togl is copyrighted by Paul Obermeier and distributed under the BSD license. This module wraps OpenGL functionality up to OpenGL Version 4.1, the GLU library functions based on Version 1.2 and most of the available OpenGL extensions. It is implemented with the help of the GLEW library. Standard shapes (box, sphere, cylinder, teapot, ...) with a GLUT compatible syntax are supplied here, too. Requirements for this module: An OpenGL compatible library. 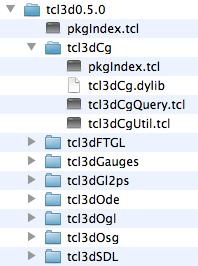 OpenGL header files are contained in the Tcl3D distribution. The GLEW library is distributed under a modified BSD license. See the GLEW Credits & Copyright page for detailled license information. The original GLUT shape code is copyrighted by Mark Kilgard. It is not in the public domain, but freely distributable. See the GLUT homepage for detailled license information. 3D vector and transformation matrix module. Virtual track- and arcball module. C/C++ based utility functions for some of the demo applications. The Tcl3D utility library files (see below for exceptions) are copyrighted by Paul Obermeier and distributed under the BSD license. The original Wavefront parser code is copyrighted by Nate Robins. The original code of tcl3dSphere is copyrighted by Paul Bourke. The original code of tcl3dHelix is copyrighted by Dario Corno. The original code of tcl3dArcBall is copyrighted by Tatewake.com. The original code of tcl3dTrackball is copyrighted by Gavin Bell et al. This module wraps NVidia's Cg shader library based on version 2.2.0017 and adds some Cg related utility procedures. Requirements for this module: The Cg library and header files. The Cg library is distributed by NVidia under a redistributable license. See the Cg download page for detailled license information. This module wraps the SDL library based on version 1.2.9 and adds some SDL related utility procedures. Currently only the functions related to joystick and CD-ROM handling have been used and tested. Requirements for this module: The SDL library and header files. The SDL library is distributed under the LGPL license. See the SDL license file for detailled license information. This module wraps the FTGL library based on version 2.1.3 RC5 and adds some FTGL related utility procedures. Requirements for this module: The FTGL and Freetype2 library and header files. The FTGL library is distributed under the LGPL license. See the FTGL homepage for detailled license information. The Freetype library is distributed under the Freetype license, a BSD style license. See the Freetype license file for detailled license information. This module wraps the GL2PS library based on version 1.3.5 and adds some GL2PS related utility procedures. GL2PS is a C library providing high quality vector output (PostScript, PDF, SVG) for any OpenGL application. It does not support textures. The GL2PS library is distributed under the LGPL license. See file COPYING.GL2PS in Tcl3D directory tcl3dGl2ps for detailled license information. This module wraps the OpenSource physics engine ODE based on version 0.7 and adds some ODE related utility procedures. Requirements for this module: The ODE library and header files. The ODE library is distributed under the BSD license. See the ODE license file for detailled license information. This module wraps the OpenSceneGraph library based on version 2.8.2 and adds some OSG related utility procedures. This is the first release and still lots of work to do. See the OSG specific documentation page for more information. Requirements for this module: The OSG library and header files. The OpenSceneGraph library is distributed under the OpenSceneGraph license, a LGPL style license. See the OSG license file for detailled license information. This package implements the following gauges: airspeed, altimeter, compass, tiltmeter. The Tcl3D gauge library is copyrighted by Victor G. Bonilla and distributed under the BSD license.